It’s the beginning of the year, so it’s a great time to take stock of our lives and our homes. We’ve put together a list of the things that people forget to clean most often. Are you guilty of neglecting any of the items on this list? If you are, take a few minutes to clean them now so you can start the year off as clean as possible! Did you know that your phone may actually be the dirtiest, germiest thing in your home? It’s true. just think of all of the surfaces you put your phone on and how often you touch it. That’s a lot of opportunities for it to pick up germs. And we put that up to our faces! Use an antibacterial wipe to kill the germs. I’m not suggesting that you haven’t vacuumed your carpet in a while (however, if it’s been more than a week, you should vacuum again too). Many people vacuum their carpets but completely forget about getting their carpets deep cleaned. Vacuuming only removes a portion of all of the dirt, grime, and bacteria in your carpets. A professional carpet cleaner will get your carpets much cleaner than your vacuum can and is an important part of keeping a clean and healthy home. Experts recommend getting your carpets cleaned at least once a year. While we’re talking about getting your carpets clean, we also need to touch on the vacuum filter. Many people clear out the canister or replace the vacuum bag but never touch the filter. If your vacuum filter is too dirty, air won’t be able to pass through it effectively and your vacuum won’t be able to clean the floor. Many vacuums allow you to clean and reuse the same filter, but others require you to completely replace the filter with a new one. Check your manual to see which is the case for your vacuum and then do it. Air vents spread air throughout our homes. If they are dirty, they will also spread dust throughout our homes. Remove the cover of the air vent and give the vent a good dusting to make sure that they’re clean. You can use a dusting stick to clean deeper in the vents. Also check and replace your furnace filter as needed. What’s the first thing you touch after you’ve been out and about, gathering germs and bacteria on your hands? Your door knobs! Many people don’t ever think to clean their doorknobs, but they can be one of the grimiest surfaces in our house and we touch them every day. A quick wipedown with a sanitizing wipe will do the trick. You probably wipe or mop your tile often. However, this isn’t good enough to keep it clean and bacteria-free. Tile comes with a sealant on it, and over time that sealant breaks down, allowing bacteria and mold to flourish in your tile and grout. A tile and grout cleaning professional will be able to sanitize your tile and reseal it so you can enjoy a healthy and clean home. If your shower curtain has some pinkish or orangeish build-up on it, I have news for you: that’s mold. Because showers curtains are often wet and in a humid environment, they are the perfect breeding ground for mold and mildew, which can impact your family’s health. Many shower curtains can be thrown in a regular washing machine to clean. Just don’t put them in the dryer (the plastic can melt). Instead, hang them back up and make sure there is plenty of ventilation while they dry completely. If you’re like most people, you just fill up your ice cube tray as soon as it’s empty and pop it back in the freezer. It’s a good idea to run your ice trays through a dishwasher every once in a while to clean them, as well as get rid of any smells they might have from other food in your freezer. No one likes to clean their trash can. I know you’re great at taking out your trash regularly, but something the bag leaks or other build up occurs in the can. In order to keep the kitchen sanitary and smelling good, we need to clean the trash can itself. Take it outside and spray it out with your hose for a quick and easy cleaning. We often touch our food, touch the microwave, and then touch our food again. This means we get grease from our food on the microwave touchpad, then whatever is on the touchpad on our food. Stop the cycle and wipe down the microwave touchpad. Hopefully, this list has helped you figure what areas in your home need a good cleaning in order to make your home as clean and healthy as possible. 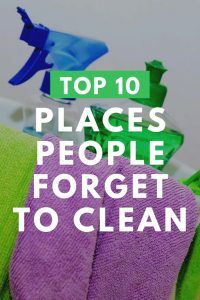 And if you’ve cleaned all of these areas recently, congrats! You’re cleaner than most people are!